Available as low as $2.60 per oz over spot! The Land Down Under is known for a variety of native species not found outside of zoos elsewhere in the world. While the koala and kangaroo are widely known, the creature depicted on the reverse side of the Perth Mint’s longest-running bullion coin series is not as well known to people around the globe. 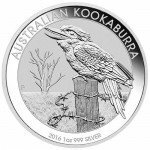 Right now, the 2016 10 oz Silver Australian Kookaburra coin is available on Silver.com. Contains ten troy ounces of .999 fine silver. Bears an all-new Kookaburra design for 2016. See annual Perth Kookaburra mintages. Debuted for the first time in 1990. Like many other popular bullion coin programs produced on an annual basis, the Silver Australian Kookaburra coin features a new reverse design each year. While the motif always focuses on the bird in a familiar environment on the continent, the specific design changes each year to increase the value and demand for these coins. 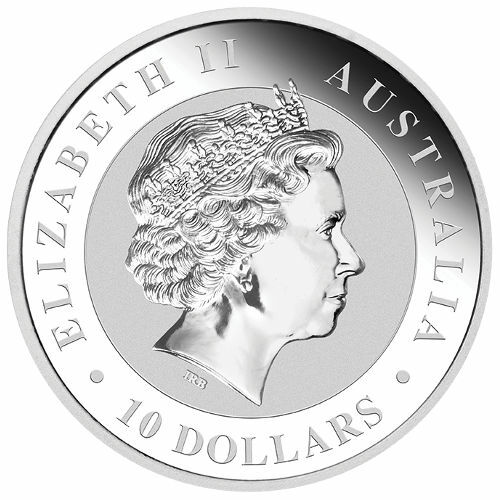 The 2016 Silver Australian Kookaburra coin is only available in 1 Kilo, 10 oz., and 1 oz. weights, with the Perth Mint foregoing its usual 2 oz coin in the series. The 1 oz coin is the only product in the series with a limited mintage, which was set at 500,000 for global distribution. 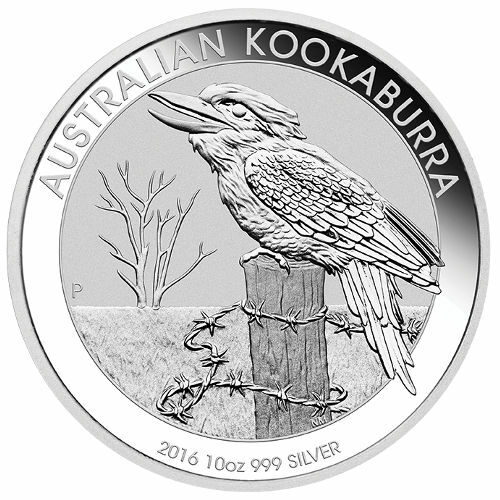 On the reverse side of each 2016 10 oz Silver Australian Kookaburra is an image of the native bird species perched atop a fence post. A string of barb wire is visible wrapped around the post, while a barren environment is clearly visible in the background. Engravings include the “P” mint mark, “Australian Kookaburra,” and the coin’s identifying features. Each Silver Australian Kookaburra offered through Silver.com in this listing is in Brilliant Uncirculated condition. BU coins bear no signs of wear and tear, but it is possible that breaks in the luster, spotted surfaces, and contact marks could be present. Silver.com is happy to answer any questions you have about these coins. You can reach our associates on the phone at 888-989-7223, online using our live web chat feature, and via email. If you are interested in similar products, please check out our full selection of Silver Perth Kookaburras.